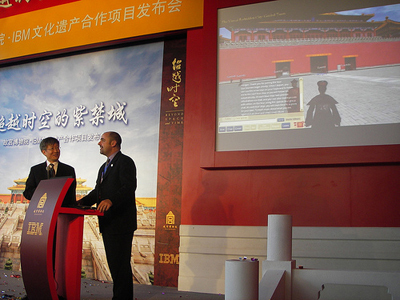 I’ve been back from the launch hoopla in China for a week now. Seems like forever. The silence* on the blog has you all wondering if I’ve retired, no doubt. Not exactly. Beyond Space and Time continues to stretch us to the limits with its popularity as we close in on 175,000 activated users. At all hours of every day you’ll find hundreds of people ambling about, mostly chatting and taking tours in Chinese. It’s so much more gratifying even than the unbelievable coverage the project has generated. 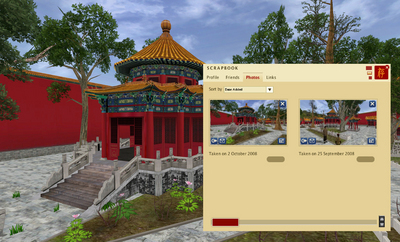 Some have understandably been confused about whether the Virtual Forbidden City is part of Second Life. (Many people consider virtual worlds and Second Life the same thing.) The short answer is no. The VFC is a separate download. For those of you who are curious — just not maybe 200 MB curious, yet — you can get a taste of the project in Second Life at our little marketing outpost for the project. The island is called BeyondSpaceAndTime and, if you have Second Life installed, you can go directly. * If you like your ramblings more frequent consider following my Twitter stream. 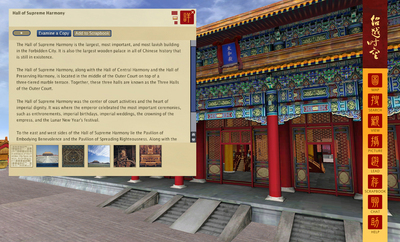 But there are plenty of other things to pass the time in the Virtual Forbidden City. Feeling anti-social? I don’t blame you. It is the most visited museum in the world in real life. So have a wander off on your own. Use the map to find locations of interest. 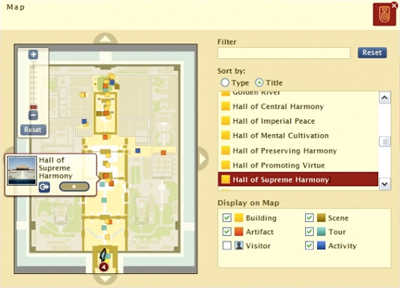 Filter by building, artifact, scene, tour, activity or even visitor name. What’s that? Eye Candy, you say? Click on nearly anything and get copious textual and photographic info. Think of it as a 3D interface to a textbook’s worth of material. 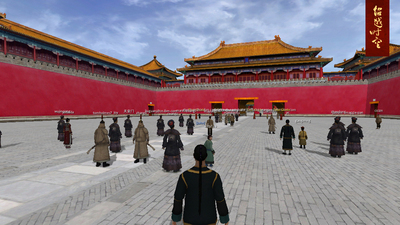 For the more visually-minded of you, the Virtual Forbidden City permits a kind of educational vandalism. Rip buildings and artifacts off their moorings for closer inspection. Zoom, rotate, love. The vastness is wearying, I know. That’s part of the design. 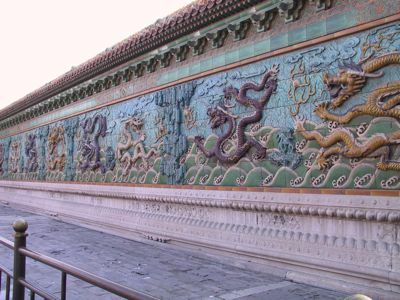 The architecture of the real Forbidden City is a psychological machine. By the time you make it to the emperor all you want to do is kowtow to relieve the aching of your feet. 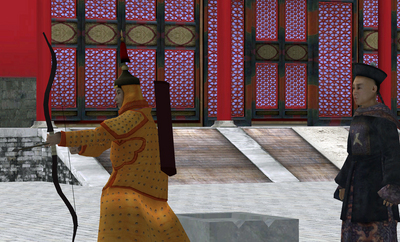 In the VFC you can encounter one of seven emperors (beyond space and time, see). These are called scenes and they present the city as a living thing. Oh, you’re having fun now! Good for you. If you care to share, take a photo. Send it to a friend via e-mail or to one of your pals on Facebook. Or just save it to your scrapbook as quick placemarks for easy teleportation (no more walking!) whenever you like. * And before you mail me, yes, I know the Chinese invented gunpowder. You can practice archery. How’s that? Today, after many long years of work with a team I can only describe as better than the best, The Forbidden City: Beyond Space and Time was made public. There is much to say and show, but for now I’ll give you a description, a video, and a link — and much appreciation for those of you who have followed, supported, or helped build this most amazing project. The street level outer wall of Tribune Tower in Chicago has all kinds of masonry and architectural adornment embedded in it from famous places around the world. A bit of the Taj Mahal, a sliver of the Parthenon, a brick or two from The Alamo, a chunk of the Berlin Wall, etc. It’s historical bricolage, literally. And a little odd, too — a sidewalk cabinet of curiosities composed of loot from Tribune reporters on foreign assignments. I get it, though. Make the foreign and faraway more accessible, touchable. A proxy for tourism. Now get ready, dear readers, for this is where I make the jump between two seemingly unrelated topics and in doing so stun you momentarily into forgetting how ham-handed the juxtaposition is. There’s a better way. 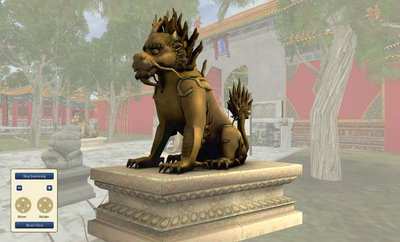 On October 10, IBM and the Palace Museum will launch The Forbidden City: Beyond Space and Time, a multi-user, immersive, three-dimensional virtual world recreation of China’s imperial palace. It won’t give you the feel of cold rock (or the microbial film of a thousand tourist fingers), but it is very much related to the desire to reach out and encounter the exotic in an embodied way. If you prefer old-fashioned coach potato-variety virtual tourism, consider tuning in to the History Channel this Sunday, Sept. 21* for the premiere of its documentary on the Beyond Space and Time project. 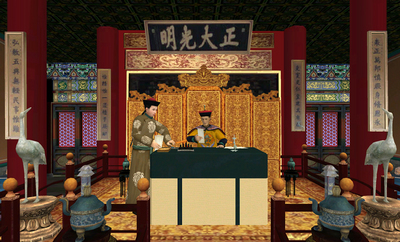 The show is the parallel story of the building of the palace and its virtual re-building, the latter explicating the former. It’s an interesting lens through which to look at a place: architecture as socio-history. Plus, I’m in it. So there’s bound to be unintentional humor, if not outright farce. * This airdate is US only. History International will broadcast the show at 9:00 PM ET on Wednesday, Sept. 24. Other international airdates to follow. UPDATE: The virtual world is live and can be found at www.beyondspaceandtime.org. 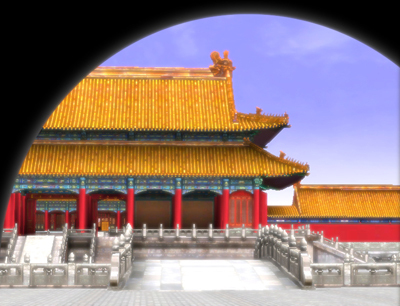 The launch date for The Forbidden City: Beyond Space and Time is now final. No, really it is. October 10, 2008. Beijing, China. See you there or in-world? Don’t have any idea what I’m talking about? Well, it has been over two years. All this talk about Ghana you’d think I wasn’t on the cusp of launching the biggest project of my career. 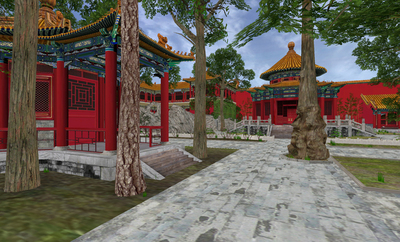 The virtual world recreation of the Forbidden City in Beijing, known as Beyond Space and Time, is made public on Sept. 17. Right now we’re in the final stretch of feature implementation, content loading, stress testing, and general cleanup. One of the many small joys of the project has been meeting Wendy Wu, a friend of a project team member who is also an accomplished calligrapher. A few years back she designed the first project logo, a calligraphed depiction of the words “beyond space and time” which, in Chinese, is a phrase used to convey something superlative or exceptional. Of course, it is also an apt description of a virtual world in English. Yesterday on a trip through Chicago Wendy was kind enough to offer a demonstration of her calligraphy technique. I’ve sped up a video of her in action — mostly to come in under Flickr’s 90 second limitation — but even in fast-motion you can see how deliberate and fluid the strokes are. Truly a wonder to watch. Jack Blanchard, long-time creative director colleague*, recently whipped up a map to answer a frequent question about the scale of the Forbidden City in Beijing. 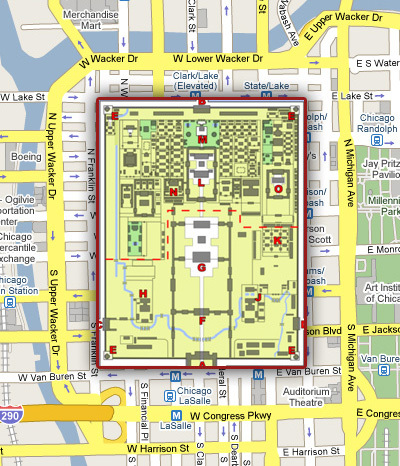 I suppose it isn’t all that helpful if you don’t know Chicago, but the short answer is: basically the size of the Loop. You know, now that I look at it, if the mayor would only carve a canal to the lake along Harrison we could give the Loop a moat. Just need to build 30-foot-thick walls and put guard towers in and we’ll be all set. Just try to mount an attack, mongrel St. Louisans! * Also impresario, dilettante, bon vivant, roustabout, part-time carnie, certified life coach, and TSA detainee. Last week I hosted a small delegation from the Palace Museum in Chicago as we head into the final stretch before launching The Forbidden City: Beyond Space and Time project. We planned a working lunch and had asked the Chinese team what they would be interested in eating. They emphatically requested traditional American fare, specifically Chicago grub. After a little hesitation, we went for it calling on the services of Portillo’s and Giordano’s. 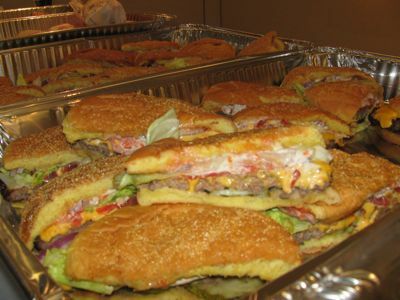 And so, in a scene not so different from me inspecting foreign delicacies at the Night Market in Beijing the Palace Museum team cautiously approached the layout of Italian beef sandwiches, cheeseburgers, hot dogs, pizza and cheesecake. I’m not sure the team enjoyed it, frankly. That much fast food heaped together was a bit nauseating to behold, even for me. Though the room-wide indigestion of the post-lunch meetings did have the salutary effect of not letting anyone drift off to sleep. Had my first dose of a live motion-capture shoot last week for the Forbidden City project. I don’t talk much about the project around these parts, but we’re in the final stretch — targeting a June 2008 launch — and this was just too cool not to document. We’re working with a game development studio in the Chicago suburbs to help us tackle the substantial modeling challenges of the project. Beyond the sheer volume of buildings, spaces, and gardens to create are the challenges of animating traditional or complex human movements found in the palace complex. 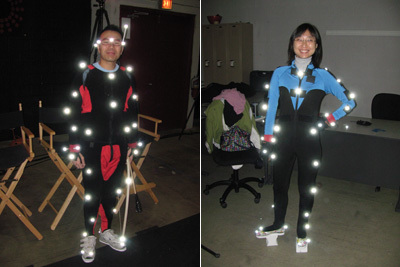 But using motion capture and two very capable actors, we were able to grab the data in one go rather than hand-model it. Pictured above left is an actor who performed archery movements and above right an actress who walked precariously on custom-made Ming-era platform shoes up and down stairs and ramps. The glowing bulbs on the suits aren’t actually lit; that’s just from my camera’s flash. But the reflectors are constantly sending back infrared signals to a forest of transmitter/receiver units circling the acting space. The data needs massaging, of course, but there’s a smoothness to it that would take far longer to model manually. Plus, certain things — like walking regally on platform shoes — is something an animator would have to guess at.